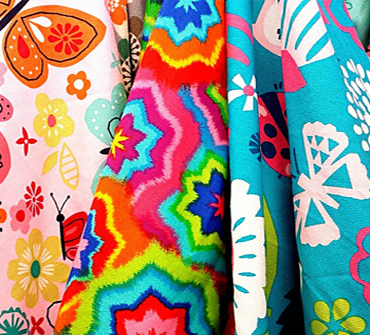 What is Digital Textile Printing system? Now we are facing serious pollution problem, and also it is difficult to find experts technicians who can work in the dyeing & printing factories. These problems made some printer manufacturers to develop and supply Digital Textile Printing (DTP). It has been almost a decade since DTP was started, which now has been recognized as the most advanced technology for prints & dye industry. The Digital Textile Printing system cannot be replaced with the conventional printing machines but definitely has evolved into another stream of printing which complements the conventional printing and vice-a-versa. 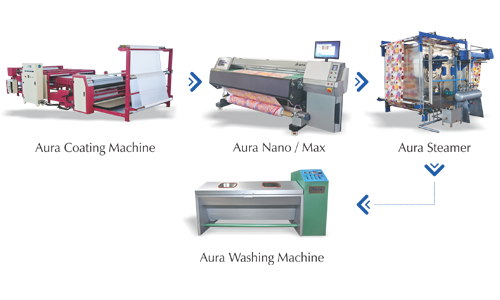 Digital Textile Printing System was first started to develop from the Inkjet type of plotter for sample development and with day-to-day improvements in resolution & speeds, now it has become a standalone shop. Also applications of these printers are varied with fast developing printing skills, media, ink etc. It is used to produce big size of photos and hanging banners that hang on the buildings to a small multi-coloured designer silk handkerchief & ties. – Printer Head: A ‘Printer Head’ is the most important part of the DTP system. Mostly these are PIEZO drop on demand print heads. Piezo Head – A ‘Head’ of ‘Piezo type’ was developed by ‘Epson’ for Inkjet printers and this type of head is used for DTP system. There are many other head manufacturers now trying to adopt to textile inks & industrial textile printing. Normally the resolution used for textile printing is 720 dpi. – Body: The construction Digital Textile Printing system currently being sold, depends mainly on the kind of fabric being used for printing and the purpose. There are various constructions depending on printing being used for flags & banners, direct disperse, sublimation paper printing or printing on fashion textiles using Reactive / Acid inks. Also it depends if you want to print directly on fabric or transfer. – Fabric feeding system: There are several types of the ‘fabric feeding system’, ‘Cylinder’ or ‘Blanket type’ etc. and again the choice is dependent on the kind of printing & fabric used. – Ink supplying System: An ‘Ink supply system’ can be varied depending on which DTP System is used. This has developed over the years and is a very important area for the performance & run-ability of the inks. The “bulk ink” systems over a “cartridge type” system makes the inks to run better and also coupled with a degassing system helps to remove the unwanted bubbles in the ink, hence giving a better ink performance and lower maintenance and down time of the machine. Types of ink that can be used for DTP system are ‘ Reactive Inks ‘ , ‘ Acid Inks ‘ , ‘ Disperse inks ‘ and ‘ Pigmented Inks ‘. ① Reactive Ink – This ink is the mostly used ink in general textile industry. It has almost the same colour density as screen print colours and it is especially suitable for home textiles & fashion fabrics. It is used for cotton, silk or even wool. Post printing, it has to be steamed at +/-102℃ for achieving high quality of colours & fastness. ② Acid Ink – It is used for general sportswear such as swimming suits etc made out of NYLON LYCRA or fabrics from Animal fibre such as wool & silk. Though it offers bright and fresh colours like reactive inks, but due to higher flexibility of reactive inks, they are preferred more over acid inks until unless the production is restricted to only exclusive fabric like silk or nylon. Also high ‘ultraviolet light resistance’ can be obtained by steaming process like in case of reactive inks. ③ Disperse Dye Ink – It is used for polyester and good for home textiles, fashion wear, sportswear & also flag printing. There are various ways for post printing process for disperse inks depending on the purpose of use. ④ Pigmented Ink – It is used mostly for textile design printing & T-shirt printing. Thin fabric such as polyester, georgette, polyester-georgette, chiffon etc. can be also suitable fabric for this ink. Needs high temperature for fixing the inks, but no steam is required. The RIP software plays an equal important role in the Digital Textile Printing as the machine itself. It allows you to choose or change colours and also previews the print result on your screen before you actually print out. You can modify intensities of inks, saturation etc and a good RIP acts as a bridge between the design system and the printer as it allows you to print several meters of continuous fabric without resting. This is system is indeed very important to match colours as shown on the monitor to colours appearing on the print, or colours over various fabrics. Though it seemingly involves a very complicated procedures, but if mastered gives brilliance to the print job. For better print process and achieving the right colour, pre-setting, steaming & washing processes are essential processes used during Digital Textile Printing. – Pre-setting process for fabric. To print via DTP System, pre-setting process is essential. The purpose of the pre-setting process is to get better absorption & stability of the ink on the fabric during & after the print. Subsequently, the post treatment can be made depending on what kind of ink & fabric you are using. Printed result via DTP system (Especially for Reactive / Acid & in some cases disperse inks) should go through steaming or washing process to finish. Without it, you would not get desired colours & fastness as the inks are water-soluble. Finishing Process: Printed result has to undergo the finishing process, such as steaming, washing etc. The most notable advantage of digital printing is that there is no limitation in colours during printing process. Theoretically 16 million colours & shades can be produced via DTP. The DTP system is ideal for sample printing as you reduce your cost and the result is immediate in comparison to the conventional ways where long wait time is required. Moreover process of making screens or etching the cylinder to find the right sample is too expensive. In addition, with digital textile printing system, you can obtain good results for special fabrics and create a niche designer market for your range of prints. Lastly but most importantly, this technology is eco-friendly and saves pollution & water in comparison to conventional printing. There is no discharge of dyes & chemicals and no certification for pollution checks is needed for setting up the project.